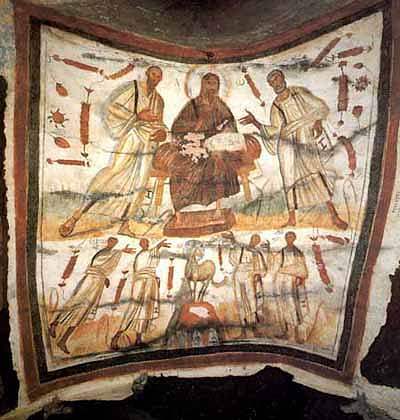 Marcellinus was a priest, and Peter an exorcist, both of the clergy of Rome, and eminent for their zeal and piety. In the persecution of Diocletian, about the year 304, they were condemned to die for their faith. By a secret order of the judge, the executioner led them into a forest, that the holy men may be executed privately, so no Christians might be acquainted with the place of their remains. When he had brought them into a thicket overgrown with thorns and briers, three miles from Rome, he declared to them the order he had received. The Saints cheerfully went to work, dug up the brambles, and cleared a spot fit for their grave. After they were beheaded, their bodies were buried in the same place. Some time after, Lucilla, a pious lady, being informed by revelation, and assisted by another devout lady named Firmina, took up their bodies, and honorably interred them near that of Saint Tiburtius (Aug. 11) on the Lavican road (Via Labicana) in what became known as the Catacombs of Marcellinus and Peter. Pope Damasus assures us, that, when a child, he learned all these particulars from the mouth of the executioner himself, and he has inserted them in a Latin epitaph with which he adorned their tomb. Anastasios the Librarian testifies, from ancient registers, that Constantine the Great built here a church in honor of these martyrs, in which he caused his mother Saint Helen to be buried in a porphyry tomb, on the Lavican road, three miles from Rome, and that he gave to this church a paten weighing thirty-five pounds of pure gold, with many other rich presents; which are also mentioned by Bede, Ado, and Sigebert. The porphyry mausoleum of Saint Helen is still shown among other antiquities near the Lateran Basilic. 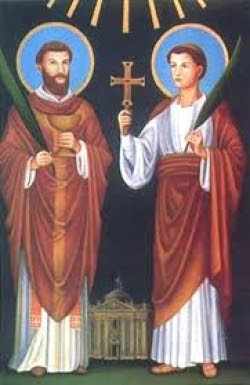 Honorius I and Adrian I repaired this church and cemetery of Saint Tiburtius, and Saints Marcellinus and Peter, as Anastasios mentions. 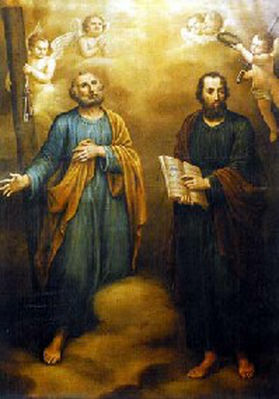 Not long after the bodies of Saints Marcellinus and Peter were translated to Germany on the following occasion: Eginhard, a German, the favorite secretary of Charlemagne, and his wife Emma, by mutual consent, made a vow of perpetual continency; and becoming a monk, was chosen abbot of Fontenelle, and, in 819, abbot of Ghent. Emma died in 836, to his great affliction, as appears from the letters of Lupus, abbot of Ferrieres, to him. This great man, in 827, sent his secretary to Rome, to procure from Pope Gregory IV some relics of martyrs to enrich the monasteries which he had founded or repaired. 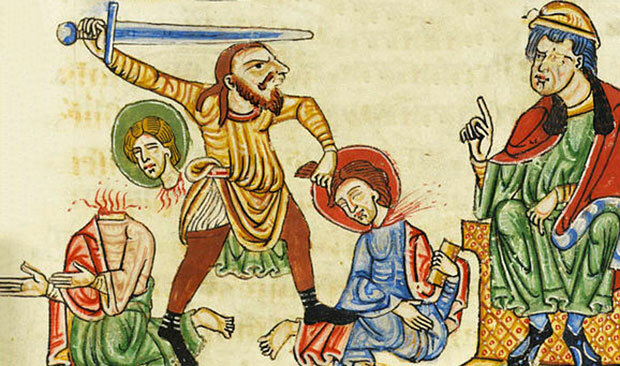 The Pope sent him the bodies of Saints Marcellinus and Peter, which Eginhard translated to Strasburg. But soon after he deposited them first at Michlenstad; and afterwards at Malinheim, since called Selgenstad, three leagues from Francfort, and two from Achaffenburgh; where, in 829, he built to their honor a church and monastery, of which he died the first abbot. Besides the life of Charlemagne, and the annals of France, during the reigns of Pepin, Charlemagne, and Lewis Debonnaire, he wrote four books in prose, and one in verse, on the translation of Saints Marcellinus and Peter. This translation is also mentioned by Sigebert, Aymoinus and Rabanus Maurus. When the Church of Santi Marcellino e Pietro al Laterano was rebuilt in Rome in 1256 by Pope Alexander IV, the martyrs' relics were putatively returned. The Cathedral of Cremona also claims their relics; there is a sarcophagus in its transept said to contain the relics of Marcellinus and Peter. Pope Gregory the Great preached his twenty homilies on the Gospels in the Church of Saints Marcellinus and Peter at Rome; as appears from some of them, and from the testimony of John the Deacon.